It happened so that Ferran Adrià became an inspiring personality for the whole trip. While making the plan and reading about Barcelona and Catalan food I realized very quickly that he was someone to dig deeper around. A chef of elBulli, a 3 star Micheline restaurant, judged to be the best in the world by the Restaurant Magazine for the record 5 times, located in Costa Brava close to Barcelona. Someone who created the New Nouvelle cuisine and forever changed the world status of Spanish food, was actually based in the city I was going to. I knew literally nothing about haute cuisine before this trip. My interest started from Clotilde's Chocolate & Zucchini post about elBulli. She got lucky to get a reservation at almost impossible to get into restaurant and wrote about it. She described the dinner lasting several hours and consisting of 20 or 30 super strange micro dishes following one another, each requiring special serving and way of eating. Close to collapse in my head I started reading Ferran: The Inside Story of El Bulli and the Man Who Reinvented Food . What I understood from the book was that Ferran's 'revolution' refers to non-traditional cooking techniques (also referred to as molecular gastronomy) that are able to reveal or change the taste of food. They also transform its texture and look. Thus a flavor you already know presents itself to you in an unexpected appearance and can touch your associations and emotions. elBulli also created a very distinct dining atmosphere. Do I need to say how much I wanted to go and try it myself? The first thing I found was that elBulli was closing this July. Apparently I was not meant to get there. It also turned out too late to get a reservation in the Tickets (Ferran's tapas bar in Barcelona). OK, I started researching Inopia, which is his brother's Albert tapas bar and it turned out recently closed as well. Then I realized that there were other chefs who worked with Ferran et elBulli. Here was my way out. I got a reservation at the restaurant of Robert Gelonch, who worked in elBulli and now started a New Catalan cuisine restaurant. 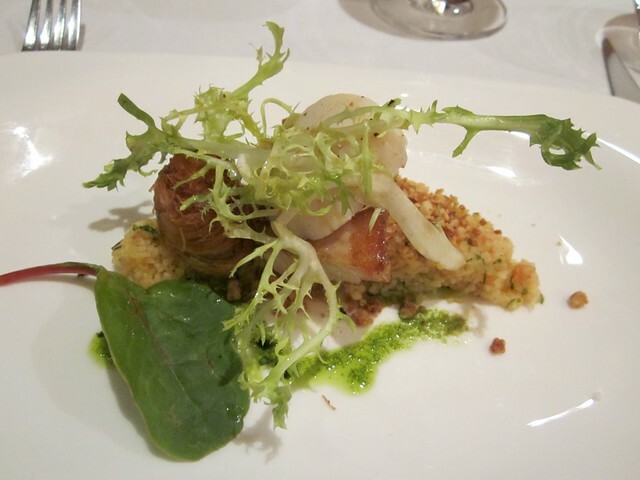 The degustation menu, which had to be reserved in advance, consisted of 9 to 12 dishes. I honestly tried to get an idea of what the dishes were about, but my translation of the menu from Catalan didn't really succeed. The long explanations of ingredients, techniques and combinations seemed to drive Google Translate mad, so most of the menu I only understood during the dinner. We arrived at C. Bailén, 56 right on time, at 9 pm, which is pretty usual in Barcelona for the dinner start. From the outside the place looked unremarkable, I would never find it by chance. However looking closer at through its colored glass door, you could assume it has something to do with fusion. I must say that from the moment we entered, I felt very special all evening. The maitre d' speaking perfect English made us feel like long expected welcome guests. The hall was very simple in its design. The music was calming and turning to somewhat reflecting mode. Once we sat at one of its 3 or 4 tables, I noticed the kitchen door right in front of me. The little window in it was opening from time to time and I could see the little kitchen and chefs working. Robert Gelonch was there, working as well and sometimes looking out at the dining hall and the faces of the guests. The other 3 tables quickly got occupied with other guests. I could tell some of them were also tourists, like us. I asked the maitre d' to help us with the choice of wine - I wouldn't do it myself given that I didn't really understand the menu. The restaurant has quite an elaborate list of local and imported wines, some offered by bottle and some - by the glass. He suggested us a flowery light Catalan dry white wine, which we liked a lot. Finally, the show started. From appetizers. 1. Gazpacho with strawberry air. The maitre d' was serving every dish coming out the little kitchen window, telling about its idea and explaining how we should eat it. We were drinking and wondering. Apart from being a real tasty gazpacho the soup really had very intense flavor and aroma of fresh strawberry, but you couldn't tell where it was coming from. 2. Salad with pancetta, grilled scallop, crispy prawn and tabule with dried fruits. This was complicated. Each ingredient, even the tiny sprouts of greens on top tasted amazing. But I was not educated enough to tell why these were at one plate. The pancetta was slow cooked (over something above 10 hours). Here was the moment I ate meat for the first time in around a year. It had a half centimeter edge of fat around it. I'd never even try it in normal life, but here I did and I can't tell you how amazing this fat tasted. The prawn was wrapped in crispy pastry threads, like those used in some of the Arabic sweets. 3. Carpaccio of Wagyū beef with smoke, honey croutons, blanched rocket and parmesan. It came under a glass spheric cover, holding down a cloud of white smoke. The maitre d' set the plates before us and removed the covers, allowing us to breath in the smoke. The dish mirrored the traditional carpaccio. I guess what was done to it is called deconstruction in Ferran: The Inside Story. The dish gets decomposed into individual components (in this case - raw beef, oil, balsamic vinegar, rocket, bread, pepper and parmesan) . Each component gets transformed (e.g. here the beef was from a special cow breed and got smoked over 30 seconds, the rocket was blanched, the bread turned into honey croutons). Then the dish is reassembled and gets a completely new life, taste and appearance. This one was majestic. 4. Squid noodles with deconstructed pesto: parmesan juice, basil oil and garlic chips and pine nuts. The noodle was actually made of grilled squid stripes, but it tasted exactly like al dente cooked pasta with pesto. I asked about 'parmesan juice' and was really amazed by the fact that the maitre d' readily told me how they make it. They boil finely grated parmesan in water and then make the sauce out of the whey (I didn't catch all the details). 5. Quail egg with anémona, grilled baby squid, chorizo flakes, asparagus and garlic sauce. This combination tasted great to me. 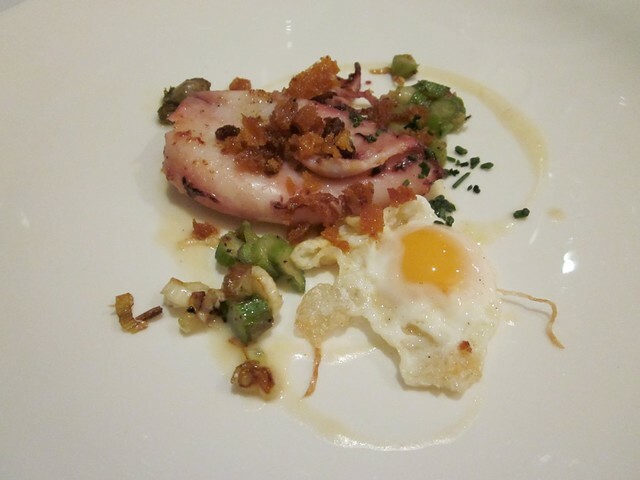 The perfect tender squid with melting egg yolk... Don't ask me what the anémona is though. It tasted like very weird seafood, but I still can't find what it stands for. 6. 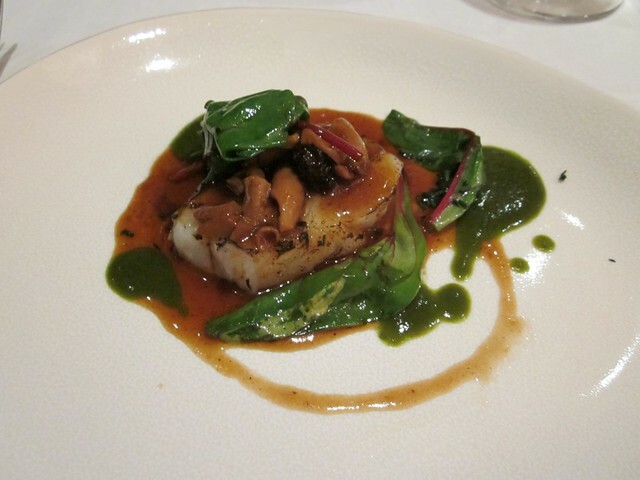 Cod hill with morchella (morels) mushrooms. We got so impressed by the mushrooms that we even bought some at La Boqueria later. 7. Here we arrived at the main coarse. A stew of Wagyū beef garnished with parsnip and water cress in cream sauce. After this amazing row of appetizers this still felt like something outstanding, something that was leading the whole game. And it certainly had French inspiration. 8. Now we moved to desserts. Balearic islands - a dessert gathering best ingredients traditional for Majorca and Minorca. I can't tell you how much time I spent trying to translate its description before the dinner - didn't work. Now I know. It was the cake of chorizo with ice-cream of ensaimada (traditional Spanish pastry - yes, and it really tasted like it), cream of Mahón cheese and reduction of Soller mandarin juice. I know in sounds controversial, but it tasted perfect. 9. Green tea cake with herb cream, chocolate snow and caramelized pistachios. This one I liked as well. The chocolate snow was quite remarkable - tasted like pure coco (with no sugar, oil or cream) with a texture of snow. And, wait!, a complement: rum truffle and a brownie. We left paying some 65 euros per person, which felt like ridiculously low for such an experience. It felt like a gentle 'entrance' for me. Besides the fact we just had a marvelous evening, I felt like I got some starting understanding of New Nouvelle cuisine. It proved quite helpful later that week, when we went to Espaisucre - a dessert restaurant I'll write shortly about.